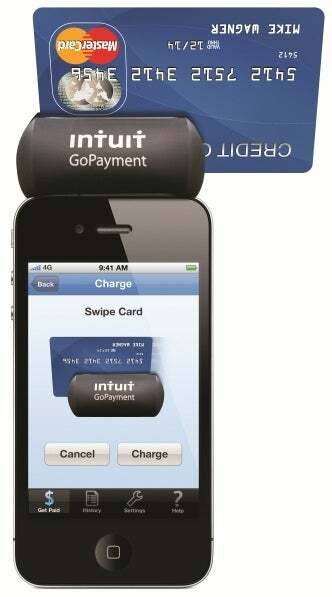 Intuit's credit card reader works with Android and iOS devices. The Intuit GoPayment mobile payment processing system includes a free card reader and apps for iOS 4.0+ devices and most Android phones and tablets. Using this pay-as-you-go service, you can accept Visa, MasterCard, American Express, and Discover cards for a fee of 2.7 percent of the total sale for swiped transactions, or a 3.5 percent fee for keyed-in transactions. Opt for Intuit’s $13-per-month subscription plan, and your fees drop to 1.7 percent per swiped transaction, or 2.7 percent per keyed-in transaction. You can void and refund a sale, but only for the original transaction amount (partial refunds are not allowed). If you use Intuit’s Web interface, however, you can process partial refunds as well as charge cards, authorize funds, capture authorized funds, and even set up recurring payments. Although GoPayment doesn’t accept or track cash payments, it does track tips. It can also look up and assess the correct sales tax based on your current GPS location. You can send your customer a receipt via email or text message, with the option of adding this contact information to your contact database on your device, so you can remain in touch with the customer via newsletters, special offers, and other marketing materials. 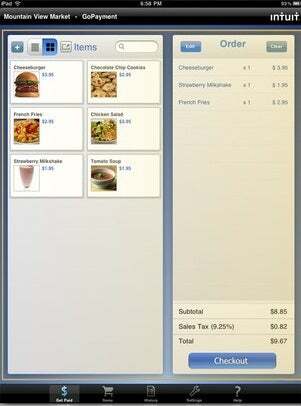 With Android devices, you can print receipts on supported Bluetooth card terminals/printers. If your business is a nonprofit operation, the service's fundraising feature can keep track of donations and contributors. Here's how Intuit's GoPayment user interface looks on an iPad. The GoPayment card reader was the bulkiest of the four mobile payment processors we tested, but it was also the least likely to swivel around while we swiped a card. The GoPayment app isn’t as good as the reader. On the upside, it supports multiple user accounts, in case several people will be taking payments for you. But an odd split divides the tasks that you can accomplish via the app and those that you can do on the GoPayment website. The website enables you to search for and view transactions, as well as generate reports; you can also set up recurring payments. But you can’t view an itemized receipt that shows prices, taxes, and tips--you can see these details only on the app.